ViewPoint provides a complete turnkey solution to study Sleep & Awakening phases from your electrophysiological signal. - SleepScore software allows the acquisition of electrophysiological signals required in animal sleep analysis. It offers the opportunity to quantify the distribution of various states of vigilance over several days and a spectral analysis. Its scoring algorithm analyzes vigilance states, totally or partially overseen. It uses a probability approach with no threshold. This feature offers the ability to make a specific deprivation of slow wave sleep (SWS) or paradoxical sleep (REM sleep) when coupled to a Sleep Deprivation chamber. This module allows the data acquisition from the acquisition card and the simultaneous recording of up to 32 channels at up to 2000 hertz each, with several synchronized videos. The software is built to prevent drift and gap between the video and the acquisition of psychophysiological data, enabling perfectly synchronized 24/7 recordings. SleepScore sampling mode offers the ability to schedule specific deprivation for slow wave sleep (SWS) or paradoxical sleep (REM) define in an existing configuration file exported from the scoring module. All files are easily importable under any signal analysis software. 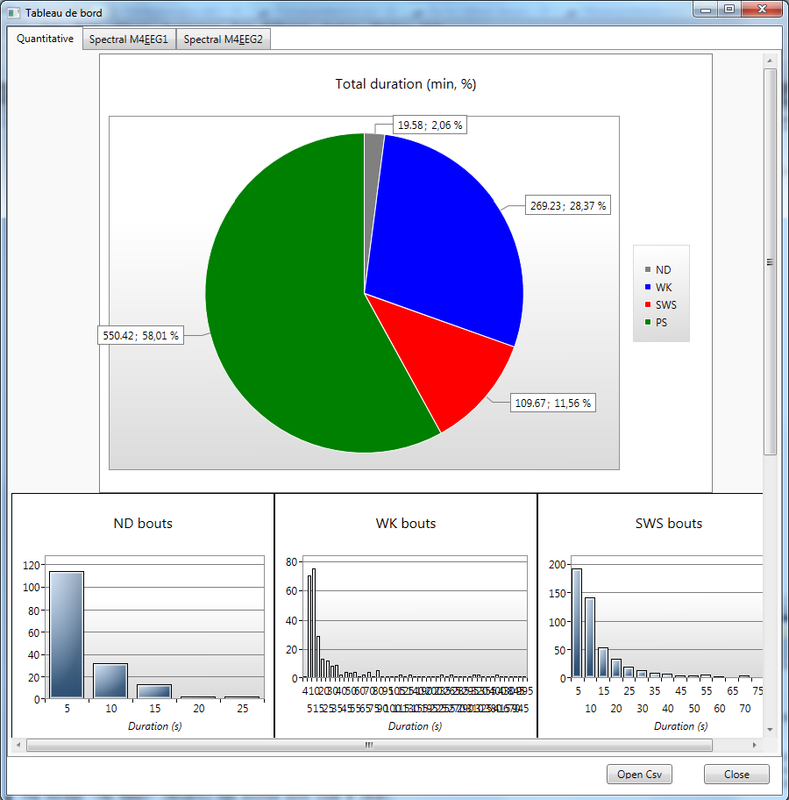 This module provides users with a way to score various states of vigilance and creates several customizable reports. The “Prescore” function is able to analyze many hours data files in a couple of seconds with close to 90 % accuracy compared to manual scoring. It also offers a common basis to all the users in the laboratory, reducing thus the variability in the analysis. This mode does not require preliminary settings. The algorithm performs a self-learning and scores the vigilance states by a probability method based on the EEG and EMG characteristics defining the various states of vigilance. The software also allows the learning of the scoring from a manually scored file. SleepScore can also score files based on user defined scoring criteria. This module features a display and a smooth navigation in both psychophysiological and behavioral data (video, actimetry, etc...). Analysis and additional processing on the signal are also available (frequency analysis, filtering, etc...). Spectrum analysis : by state you will be able to analyze the average spectrum, the medium frequency band. SleepScore works thanks to a digitizing card, a PC and a sleep deprivation module (cylinder). The software also offers the ability to record up to 4 synchronized cameras. From these videos, SleepScore can calculate the global activity of animals under cameras. The software has a database which allows a simple and effective management of several files resulting from various methods.